This is a new favorite in our home. Here we sit, with dust in the air and budgeting every single penny. We even recently got a couple of old ringer washers from an auction (though ours are electric instead of gas powered) for backup in case our front-loader kicks the bucket. So much of Keepin' It Together hits home with our family. We had two girls first and they were older before #3 came along. A little school house in Beaver County is our favorite place to have special events for our children. Our oldest's Sweet 16 Purity Party was there and the oldest two had their Jr./Sr. Music Recital there. It's definitely a special place in the community still today. Some chapters in this book had us about in tears for the characters and some had us in stitches, laughing so hard. Our children were so involved, they wanted ...WANTED... to take turns reading! Whoohoo! I love, LOVE, LOVE a book that makes my children want to read it themselves! The end did leave us wondering. Our 13 year old has dubbed it a 'cliff hanger' and is looking forward to a 2nd. I surely hope Mrs. Frantz decides to write a sequel. If you need a good Historical fiction for the Dust Bowl years that is clean and safe for your family, GET THIS BOOK! It's a lovely little story, fictional, but based on real life in the Panhandle of Oklahoma in the 1930's. Description: Keepin' It Together, set in the Oklahoma Panhandle during the Depression / Dust Bowl days of the 1930's, tells the story of Ada Joyce and her family, who by sheer will to survive and succeed, overcome monumental tasks and difficulties to show a true picture of life during those trying times. Author Virginia Frantz lived those times, and was recently interviewed for Ken Burns' documentary, "Dust Bowl", on PBS. Some links in the post(s) below are “affiliate links.” This means if you click on the link and make a purchase, we receive a commission. We only recommend products or services we use personally or believe valuable to readers. We are disclosing this in accordance with the FTC’s 16 CFR, Part 255: “Guides Concerning the Use of Endorsements and Testimonials in Advertising.” See our disclosure policy for details. Author Bio: Virginia Frantz, mother of seven, was raised on a farm in Beaver County, Oklahoma. At age 42 she returned to Oklahoma Panhandle State University to finish her education degree. She then taught in the Guymon, Oklahoma, School system for 20 years and following that, was a student teacher supervisor at OPSU for four years and later substituted in the Guymon School classrooms until 2009, when she chose to work full time on her writing. Make sure to visit Virginia at her website! Please link up only ONE POST url. (ie.. http://www.yoursite.com/post-name/). Share and comment on at least ONE other link. Following and linking back is appreciated, but not required. That does sound like an interesting book. 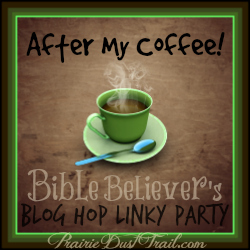 Thanks for offering this blog hop today. Took me a moment to figure out what to do, but I'm here. Thanks for taking time Marilynn. I like Linkytools better than Inlinkz for a number of reasons, but it does take a little more effort for those linking up. Hopefully we'll have lots of links anyway!